To Cite: Mojaddar Langroodi A, Ebadi Fathabad A, Moulodi F, Mashak Z, Alizade Khaled Abad M. Antioxidant and Antimicrobial Activities of Aqueous and Ethanolic Extracts of Barberry and Zataria multiflora Boiss Essential Oil Against Some Food-Borne Bacteria, J Kermanshah Univ Med Sci. 2018 ; 22(2):e83087. doi: 10.5812/jkums.83087. Background: Researchers have recently focused on the use of natural compounds, especially essential oils of high antioxidant and antimicrobial properties in order to reduce the risks of synthetic preservatives. Objectives: Also Therefore, the present study examined the antimicrobial and antioxidant properties of Zataria multiflora Boiss essential oil and Berberis vulgaris water and ethanol extract (BGE). Methods: In this experimental study, the components of the essential oil were analyzed by GC/MS. The minimum inhibitory concentration (MIC) was determined by the last well without turbidity, the minimum bactericidal concentration (MBC) was determined by culturing the wells without turbidity, and the least concentration of essential oil that inhibits bacterial growth was determined by microdilution method. The antioxidant activity of different concentrations of ZEO and BGE was measured by 2, 2-diphenyl, 1-picrylhydrazyl (DPPH) radical scavenging, β-carotene-linoleic acid assays and the level of total phenolic. Results: Thymol was found to be the major component of ZEO through chemical composition analysis (44.82%). The results of antioxidative tests indicated that BGE was significantly more potent (P < 0.05) than ZEO. Furthermore, the phenolic content in BG water and ethanol extracts and ZEO were (242.3, 274.6 and 215.4 mg per 100 g), respectively. Furthermore, β-carotene/linoleic acid assay revealed antioxidant inhibition of 67.4%, 62.8% and 73.2% respectively for water extract of BG, ethanol extract of BG and ZEO. Conclusions: The results of this study showed that water and ethanol extracts of BG and essential oil of ZEO have antibacterial and antioxidant properties. Hence, it is suggested that these compounds be added to food products to increase their shelf life. Foodborne pathogenic microorganisms and the prevalence of diseases they cause impose many financial and human losses in the world every year. In addition, food spoilage due to the growth of microorganisms continues to be a serious concern in the food industry (1, 2). Today, the tendency to use natural preservatives has increased due to the harmful effects of chemical preservatives. Hence, finding new natural compounds to minimize the growth and activity of harmful germs and reduce fat oxidation is absolutely essential. There are numerous antibacterial and antioxidant substances of animal, plant and microbial origin that play an important role in fighting microorganisms and in reducing the formation of free radicals (3). In this regard, plant-borne compounds such as herbs, spices, essential oils and extracts account for the largest share (2). Zataria multiflora Boiss (Shirazi thyme) from the Lamiaceae family, is a perennial plant with a height of 10 - 40 cm, with multiple stems and small leaves with round or oval short petioles, growing in Iran and some neighboring countries (4). Phenolic compounds such as thymol and carvacrol are among the main components of the plant. The antimicrobial and antioxidant properties of this plant are generally approved. A number of compounds of its essential oil that do not pose any risk to the health of consumers have been registered by the European Food Safety Association for use as flavors, including carvacrol, carvone, cinnamaldehyde, and para-cymene. Usually, these flavors are approved after toxicological and metabolic studies (5). Barberry, scientifically known as Berberis vulgaris from the Berberidaceae family has red fleshy sour fruits. The plant grows in different parts of the world and has a long history in traditional medicine (6). Some of its alkaloids, such as berberine, berbamine, palmatine, oxyacanthine, condocorine, tetrandrine, have been identified after degradation, with different healing properties (7, 8). Souri et al. (9) studied the antioxidant properties of 60 plant species native to Iran and showed that barberry has high antioxidant properties (49.95% in 0.4 micrograms). Shahsavari et al. (10) investigated the antioxidant properties of Shirazi thyme, and Fazel et al. (11) investigated summer savory and thyme, showing high antibacterial activity of the essential oil. Evidence shows the antioxidant and antimicrobial properties of these plants. Moreover, their essential oils are edible and have antimicrobial and antioxidant properties, so they appear to have fewer side effects compared to other compounds. Therefore, the present study examined the chemical composition of Zataria multiflora Boiss essential oil (ZEO) using gas chromatofigurey mass spectrometry (GC-MS), and the antioxidant and antimicrobial properties of ZEO and aqueous and alcoholic extracts of barberry against a number of foodborne bacteria in vitro. First, the ripe seedless fruit of barberry was procured from Tehran (Iran) market, and then it was transferred to the laboratory after identification and approval by the Tehran University Medicinal Plants Research Center. After washing, barberries were well grounded and filtered by a 2-mm mesh sieve. Then 250 g of barberry powder was mixed with ethanol and distilled water and placed in a shaker for about 24 hours. The mixture was filtered with a paper filter, and placed on rotary at 45°C for 24 hours. The standard Zataria multiflora Boiss essential oil used in this study was purchased from the Barij Essence Company and transferred to the laboratory in dark glass containers in packages without contact with light or air (12). Standard strains were used to evaluate antibacterial effects of ZEO and barberry extracts. These strains, procured from the bacteriology laboratory of the Faculty of Veterinary Medicine, Islamic Azad University, Karaj Branch, were Staphylococcus aureus (ATCC 25923), Salmonella typhimurium (ATCC 14028), Bacillus cereus (ATCC 9643), Escherichia coli (ATCC 25922) and Listeria monocytogenes (ATCC 19117). The studied strains were identified using culture media and biochemical tests. First, 100 μL of Mueller Hinton Broth (Merck, Germany) culture medium was poured in all wells at different concentrations (the amount of salt needed by each bacterium was added to all culture media used in this study). Then, 100 μL of the essential oil or extracts was added to the first well of each row (the intended concentrations of the essential oil were made with 10% dimethyl sulfoxide solvent). After mixing the contents of the first well, 100 μL was removed and added to the next well. An amount of 100 μL of the last well was discarded. One control row was considered for each test row (related to one essential oil or extract). The stages of dilution of the essential oil were performed in the same way as the test row. Then, 100 µL of the prepared bacterial suspension (with a density of 1.5 × 106 bacteria per mL) was added to the test row, but not to the control row. Microdilution method was used for this test. After 24 hours of incubation at the appropriate temperature for each bacterium, the results were read by a spectrophotometer. The presence of turbidity (compared to the control row) indicated bacterial growth and transparency, indicated lack of bacterial growth (13). In order to determine MBC, 10 μL of the wells’ content at the end of the 18-hour incubation, was cultivated on the Mueller Hinton Agar medium (Merck, Germany). Petri dishes were incubated for 18 hours to determine the growth of bacteria. Finally, the lowest concentration of essential oil or extracts, in which 99.9% of the bacteria did not grow, was reported as MBC. All tests were performed with three replicates (14). Essential oil analysis was performed by a GC-MS device (Hewlett-Packard, USA). The temperature program used in the GC-MS device was 5 minutes at 50°C with a thermal gradient of 3°C per minute, increasing the temperature to 240°C at a rate of 15°C per minute, keeping the column at 300°C for 3 minutes. The temperature of the injection chamber was 290°C and the helium gas rate was 0.8 mm/min. The temperature of the ionization source was 220°C and the ionization energy was 70 electron-volts. where, ABlank shows the optical density of the negative control and ASample shows the optical density of various concentrations of the extract. After that, the concentration of the extract with 50% free radical scavenging was calculated by the figure. Obviously, the smaller is this number, the more is the antioxidant power or free radical-scavenging. In this experiment, the synthesized antioxidant of butylated hydroxytoluene (BHT) was used as the positive control and all tests were repeated twice (15). Unsaturated fatty acids, including linoleic acid, are very sensitive to the oxidation process. As a result, the inhibition of oxidation of this substance is used as a valuable method in determining antioxidant activity. In this method, the antioxidant activity is measured by the inhibition amount of linoleic acid oxidation and the prevention of the formation of volatile compounds and conjugated hydro peroxides. To perform the test, a basic solution of beta-carotene-linoleic acid (Sigma-Aldrich) was prepared as follows: 0.5 mg of beta-carotene was dissolved in 1 mL of chloroform, and then 25 μL of linoleic acid and 200 mg of Tween 40 were added to it and completely mixed. Then chloroform was removed by vacuum evaporation and 100 mL of oxygen-saturated distilled water (30 minutes under 100 mL/min pressure) was added to it with vigorous shaking. Two and a half mL of the prepared solution was transferred to a test tube and 350 µL of the essential oil or extracts (concentration of 2 g/L in ethanol grade HPLC) was added to the test tube. All of these steps were performed for BHT as a positive control and blank (only containing 350 mL of ethanol). After 48 hours of incubation at room temperature, the optical density of the samples was read at 490 nm, and the antioxidant activity was measured by comparing the optical density of the samples with zero time and the stability of yellow color of beta-carotene in percentages (16). All samples were examined with three replicates and SPSS-19 software was used to analyze the data. The Tukey test with a confidence level of P < 0.05 was used to evaluate the comparison between the samples. The results of the analysis of Zataria multiflora Boiss essential oil indicate that about 35 compounds identified in it constitute 99.39% of the essential oil components. The major compounds of the essential oil were thymol (44.82%), carvacrol (23.3%), linalool (10.61%), carvacrol methyl ether (27.2%) and linalyl acetate (14.2%). The MIC and MBC results of the Zataria multiflora Boiss essential oil and aqueous and ethanolic extracts of barberry by broth macrodilution method on the microorganisms are presented in Table 1. Based on the results, the MIC values of Zataria multiflora Boiss essential oil for Staphylococcus aureus, Bacillus cereus, Listeria monocytogenes, Escherichia coli and Salmonella typhimurium were 1.56, 3.125, 3.125, 12.5, and 6.25, respectively. MBC of Zataria multiflora Boiss essential oil for Staphylococcus aureus, Bacillus cereus, Listeria monocytogenes, Escherichia coli and Salmonella typhimurium were 3.125, 6.25, 6.25, 25, and 12.5 mg/mL, respectively. Based on the results, the MIC of the aqueous and ethanolic extracts of barberry was 6.25 - 25 mg/mL and 3.125 - 12.5 mg/mL, respectively. The gram positive bacteria were more sensitive than the gram negative bacteria in both extracts. The Escherichia coli and Salmonella typhimurium, with an MBC of 50 and 25 mg/mL in the aqueous and ethanolic extracts of barberry were the most resistant bacteria, respectively. Research has revealed that the components of essential oils and extracts have different antibacterial properties. The results of this study showed that the inhibitory effects of ethanolic extract of barberry were higher than those of the aqueous extract. In general, according to the results of this study, gram positive bacteria are more sensitive to the essential oil and extracts than gram negative bacteria. In this study, and in DPPH tests, DPPH radical scavenging occurred more powerfully with the increasing concentrations of essential oils and extracts. In Figure 1, the concentration of extracts that scavenge 50% of radicals (IC50) is compared with the concentration of BHT. 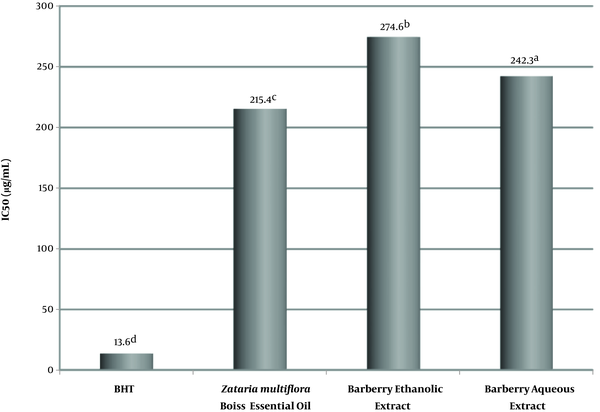 As the figure shows, the ability of free radical scavenging by Zataria multiflora Boiss essential oil and water and ethanolic extracts of barberry are 215.4, 242.3 and 274.6 µg/mL. There was a significant difference between the results for aqueous extract and ethanolic extract (P < 0.05). The free radical-scavenging of BHT (10 μg/mL) was higher than that of all extracts of the two studied plants. Figure 1. Effect of aqueous and ethanolic extracts of barberry, Zataria multiflora Boiss essential oil, and BHT positive control in DPPH free radical-scavenging. The lower case letters on the numbers in each column indicate a statistical difference (P < 0.05). According to Figure 2, in the linoleic acid oxidation prevention test in the beta-carotene-linoleic acid system at a concentration of 2 g/L, the scavenging effect of ZEO, barberry aqueous extract, and barberry ethanolic extract was 73.2%, 67.4% and 62.8%, respectively. Concerning the synthesized antioxidant of butylated hydroxytoluene, 94.5% scavenging effect was obtained in the beta-carotene-linoleic acid test. There was a statistically significant difference between the antioxidant activity of Zataria multiflora Boiss essential oil and ethanolic and aqueous extracts of barberry. Figure 2. Effect of aqueous and ethanolic extracts of barberry, Zataria multiflora Boiss essential oil, BHT positive control and negative control in of linoleic acid oxidation prevention. The lower case letters on the numbers in each column indicate a statistical difference (P < 0.05). In general, the composition of essential oils varies according to the geofigureical area of plant growth, plant variety, plant age at the time of essential oil preparation, drying method, and essential oil extraction method (17). Carvacrol, thymol, cymen, and menthol are the hydroxyl groups in the molecule of essential oil components that play an important role in the antibacterial property of plant essential oils (18). Rasooli and Mirmostafa (19) chemically analyzed two species of thyme (T. kotschyanus and T. persicus) and found average and intermediate amounts of carvacrol and thymol so that the carvacrol percentage was 22.7% and 27%, respectively; and thymol percentage was 16.5% and 27.07%, respectively. The sum of carvacrol and thymol amounts in the essential oils of these two species was less than the sum of these two main components in the present study (19). Bagci and Başer (20) studied two species of thyme in Turkey and reported the components of T. kotschyanus in the flowering stage as carvacrol (11.7%), thymol (35.5%), para-cymene (17.7%), alpha-pinene (8.8%) and alpha-terpineol (6.5%), which was similar to the present study in terms of the components, but different in terms of the percentages. Morteza-Semnani et al. (21) reported the following compounds in the study of Thymus kotschyanus and Thymus pubescens in the Behshahr area in northern Iran: Pulegon (18.7%), isomenthol (17.8%), thymol (14.9%), 1, 8-cineole (9%) and carvacrol (5.5%) which were different in terms of amounts with this study. In a study by Akhundzadeh Basti et al. (22), the effect of Zataria multiflora Boiss on the probable growth of Staphylococcus aureus in the heart and brain infusion broth medium was examined, the results of which suggested that the percentage log of Staphylococcus aureus growth probability decreases with increasing essential oil concentration, which was attributed to the high amounts of carvacrol. Their results were consistent with the present study. The amount of free radical scavenging activities in the case of extracts is concentration-dependent and, in cases where the IC50 is lower, it has more protective effects. Research has shown that this activity is mostly influenced by the presence of phenolic compounds such as flavonoids and phenolic acids in the polar sector. The role of phenolic compounds in the free radicals scavenging is also reported by other researchers (15, 23, 24). Antioxidants minimize the oxidation of lipid compounds in cell membranes or prevent the formation of volatile organic compounds and conjugated diene hydroperoxides induced by linoleic acid oxidation that are carcinogens (25). Hosseini et al. (26) examined the scavenging activity of essential oils and different fractions of methanol extract of Zataria multiflora, Salvia officinalis, Rosmarinus officinalis, Mentha pulegium and Cinnamomum zeylanicum and showed that Zataria multiflora essential oil has the highest antioxidant effect with IC50 = 667 μg/mL, which is higher than that of the present study, and their antioxidant effect is hence weaker than the essential oils of this study (26). IC50 is inversely associated with the antiradical activity of the compounds, the lower is the IC50, the higher is antiradical activity. Zhang et al. (27) examined the antioxidant activity of parsley essential oil by DPPH method. The IC50 value of this essential oil was very high (21.80 mg/mL), indicating a very poor antioxidant activity of the essential oil (27). Kamkar (28), reported the oxidation prevention power of linoleic acid in ethanolic extract of Iranian Anethum graveloens at a concentration of 2 g/L as 56%. In relation to the butylated hydroxytoluene, 95% inhibitory effect was reported in the beta-carotene-linoleic acid system. Also, in the study by Sultana et al. (29) on different types of corncob extracts, the radical scavenging power of methanolic extracts was higher than that of the rest of extracts. Aridogan et al. (30) examined the antibacterial effect of eight aromatic plants’ volatile oils on Escherichia coli, Staphylococcus aureus, and Pseudomonas aeruginosa. Their results showed that peppermint applies its antibacterial activity only on Staphylococcus aureus. Khanjari et al. (31) investigated the antimicrobial activity of Zataria multiflora Boiss on the growth probability of Vibrio parahaemolyticus in the heart and brain infusion broth culture medium in different concentrations and observed that higher concentrations would have a higher bactericidal effect and lower growth probability of Vibrio parahaemolyticusy. Khaleghi et al. (32) evaluated the antioxidant effect of barberry extract on oxidation of a sausage stored in the refrigerator and indicated that this essential oil could decrease oxidation and postpone it due to the presence of phenolic compounds in the extract. A study by Razavilar et al. (33) on the effects of Zataria multiflora Boiss essential oil, acetic acid, temperature and storage time on probable growth of Salmonella typhimurium in brain heart infusion broth showed that Zataria multiflora Boiss essential oil may possibly be used as a proper preservative and antibacterial agent against at least some of the gram-negative bacteria, including the bacteria studied in some foods (33). Using the diffusion disc technique, Vuddhakul et al. (34) studied the antimicrobial activity of fresh galangal, lemon and garlic extracts with a concentration of 10 μL per disk on the pandemic strain of Vibrio parahaemolyticusy. Their results indicated the inhibition of Vibrio parahaemolyticusy growth by these three extracts, and galangal did not have any effect on E. coli and Staphylococcus aureus (34). The structural difference between the walls of gram positive and negative bacteria affects their sensitivity to antimicrobial compounds. Gram-negative bacteria have only a thin layer of mucopeptide, and most of their wall structure is made of lipoprotein and lipopolysaccharide. As a result, higher gram-negative resistance can be attributed to the external phospholipid membrane, which is also reported by other researchers (2, 3, 8, 18). Some previous studies have reported that alcoholic, aqueous and alcohol-aqueous extracts in different plants had a particular effect on bacteria, which can be different from each other (35, 36). Antibacterial effects can be attributed to the presence of compounds such as thymol, carvacrol and linanol due to their high levels in the Zataria multiflora Boiss essential oil. Finally, it can be stated that the differences in the results obtained in different studies can be related to the variety of chemical compounds present in the plants, their different mechanisms of reaction and different kinetics of their inhibitory reactions in the selected methods. The measured antioxidant capacity of a sample is related to the method used and the source of free radical production or oxidizing agent. The results show that the antibacterial properties of Zataria multiflora Boiss essential oil were superior to barberry extracts, while the antioxidant properties of barberry extracts were higher than that of the Zataria multiflora Boiss essential oil. It can be concluded that both the essential oil of Zataria multiflora Boiss and barberry extracts have an excellent antioxidant and antimicrobial properties, while barberry extract, especially in terms of antioxidant properties has a priority in usage to Zataria multiflora Boiss essential oil. Also, according to the results of this study, it can be suggested that further studies examine the antimicrobial and antioxidant effects of these two compounds simultaneously on a diet model on the basis of desirable sensory properties. Many thanks to Dr. Nabi Shariati Far, who helped us with this research. 1. Mashak Z, Langroodi AM, Ehsani A, Ilkhanipoor A, Fathabad AE. Microbiological quality of ready-to-eat foods of Tehran province. Afr J Food Sci. 2015;9(5):257-61. doi: 10.5897/ajfs2015.1260. 2. Calo JR, Crandall PG, O'Bryan CA, Ricke SC. Essential oils as antimicrobials in food systems – A review. Food Control. 2015;54:111-9. doi: 10.1016/j.foodcont.2014.12.040. 3. Shariatifar N, Ebadi Fathabad A, Jahed Khaniki G, Nasrabadi HG. Evaluation of the antibacterial activity of essential oil and aqueous and ethanolic extracts of Quercus infectoria leaves on food-borne pathogenic bacteria. Int J Pharma Sci Res (IJPSR). 2014;5(10):709-13. 4. Azizkhani M, Misaghi A, Basti AA, Gandomi H, Hosseini H. Effects of Zataria multiflora Boiss. essential oil on growth and gene expression of enterotoxins A, C and E in Staphylococcus aureus ATCC 29213. Int J Food Microbiol. 2013;163(2-3):159-65. doi: 10.1016/j.ijfoodmicro.2013.02.020. [PubMed: 23558199]. 5. Misaghi A, Akhondzadeh Basti AA. Effects of Zataria multiflora Boiss. essential oil and nisin on Bacillus cereus ATCC 11778. Food Control. 2007;18(9):1043-9. doi: 10.1016/j.foodcont.2006.06.010. 6. Imanshahidi M, Hosseinzadeh H. Pharmacological and therapeutic effects of Berberis vulgaris and its active constituent, berberine. Phytother Res. 2008;22(8):999-1012. doi: 10.1002/ptr.2399. [PubMed: 18618524]. 7. Alimirzaee P, Gohari AR, Hajiaghaee R, Mirzaee S, Jamalifar H, Monsef-Esfahani HR, et al. 1-methyl malate from Berberis integerrima fruits enhances the antibacterial activity of ampicillin against Staphylococcus aureus. Phytother Res. 2009;23(6):797-800. doi: 10.1002/ptr.2641. [PubMed: 19172582]. 8. Singh M, Srivastava S, Rawat AK. Antimicrobial activities of Indian Berberis species. Fitoterapia. 2007;78(7-8):574-6. doi: 10.1016/j.fitote.2007.03.021. [PubMed: 17583443]. 9. Souri E, Amin G, Dehmobed-Sharifabadi A, Nazifi A, Farsam H. Antioxidative activity of sixty plants from Iran. Iran J Pharm Res. 2010:55-9. 10. Shahsavari N, Barzegar M, Sahari MA, Naghdi Badi H. An investigation on the antioxidant activity of essential oil of Zataria multiflora Boiss. in soy bean oil. J Med Plants. 2008;4(28):56-68. 11. Fazel M, Omid Beygi M, Barzegar M, Naghdi Badi H. Influence of heating on antiradical activity of essential oils of thyme, summer savory and clove by 2, 2-diphenyl-1-picrylhydrazyl (DPPH) method. J Med Plants. 2007. 12. Arabshahi-Delouee S, Urooj A. Antioxidant properties of various solvent extracts of mulberry (Morus indica L.). Food Chem. 2007;102(4):1233-40. doi: 10.1016/j.foodchem.2006.07.013. 13. Jorgensen JH, Turnidge JD. Susceptibility test methods: Dilution and disk diffusion methods. In: Jorgensen JH, Pfaller MA, Carroll KC, editors. Manual of clinical microbiology, Volume 1. 11th ed. ASM Press; 2015. p. 1253-73. doi: 10.1128/9781555817381.ch71. 14. Marzouk B, Marzouk Z, Mastouri M, Fenina N, Aouni M. Comparative evaluation of the antimicrobial activity of Citrullus colocynthis immature fruit and seed organic extracts. Afr J Biotechnol. 2011;10(11):2130-4. 15. Tan JB, Lim YY. Critical analysis of current methods for assessing the in vitro antioxidant and antibacterial activity of plant extracts. Food Chem. 2015;172:814-22. doi: 10.1016/j.foodchem.2014.09.141. [PubMed: 25442625]. 16. Dapkevicius A, Venskutonis R, van Beek TA, Linssen JPH. Antioxidant activity of extracts obtained by different isolation procedures from some aromatic herbs grown in Lithuania. J Sci Food Agr. 1998;77(1):140-6. doi: 10.1002/(sici)1097-0010(199805)77:1<140::aid-jsfa18>3.0.co;2-k.
17. Bakkali F, Averbeck S, Averbeck D, Idaomar M. Biological effects of essential oils--a review. Food Chem Toxicol. 2008;46(2):446-75. doi: 10.1016/j.fct.2007.09.106. [PubMed: 17996351]. 18. Celiktas OY, Kocabas EEH, Bedir E, Sukan FV, Ozek T, Baser KHC. Antimicrobial activities of methanol extracts and essential oils of Rosmarinus officinalis, depending on location and seasonal variations. Food Chem. 2007;100(2):553-9. doi: 10.1016/j.foodchem.2005.10.011. 19. Rasooli I, Mirmostafa SA. Bacterial susceptibility to and chemical composition of essential oils from Thymus kotschyanus and Thymus persicus. J Agric Food Chem. 2003;51(8):2200-5. doi: 10.1021/jf0261755. [PubMed: 12670156]. 20. Bagci E, Başer KH. Study of the essential oils of Thymus haussknechtii Velen and Thymus kotschyanus Boiss. et Hohen var. kotschyanus (Lamiaceae) taxa from the eastern Anatolian region in Turkey. Flavour Frag J. 2005;20(2):199-202. doi: 10.1002/ffj.1397. 21. Morteza-Semnani K, Rostami B, Akbarzadeh M. Essential oil composition of Thymus kotschyanusand Thymus pubescensfrom Iran. J Essen Oil Res. 2006;18(3):272-4. doi: 10.1080/10412905.2006.9699085. 22. Akhundzadeh Basti A, Razavilor V, Misaghi A, Radmehr B, Abbasi Far R, Yazdani D. [Effect of Zataria multiflora Bioss on Staphylococcus aureus growth potential in the brain and heart infusion broth]. J Med Plants. 2005;10:54-60. Persian. 23. Katalinic V, Milos M, Kulisic T, Jukic M. Screening of 70 medicinal plant extracts for antioxidant capacity and total phenols. Food Chem. 2006;94(4):550-7. doi: 10.1016/j.foodchem.2004.12.004. 24. Slinkard K, Singleton VL. Total phenol analysis: automation and comparison with manual methods. Am J Enol Viticult. 1977;28(1):49-55. 25. Tepe B, Daferera D, Tepe AS, Polissiou M, Sokmen A. Antioxidant activity of the essential oil and various extracts of Nepeta flavida Hub.-Mor. from Turkey. Food Chem. 2007;103(4):1358-64. 26. Hosseini N, Malekirad A, Changizi Ashtiani S, Nazemi M. [Free radicals scavenging activity of essential oils and different fractions of methanol extract of Zataria multiflora, Salvia officinalis, Rosmarinus officinalis, Mentha pulegium and Cinnamomum zeylanicum]. J Shahid Sadoughi Univ Med Sci. 2012. Persian. 27. Zhang W, Chen H, Wang Z, Lan G, Zhang L. Comparative studies on antioxidant activities of extracts and fractions from the leaves and stem of Epimedium koreanum Nakai. J Food Sci Technol. 2013;50(6):1122-9. doi: 10.1007/s13197-011-0447-4. [PubMed: 24426024]. [PubMed Central: PMC3791250]. 28. Kamkar A. [The study of antioxidant activity of essential oil and extract of Iranian Anethum graveloens]. Horizon Med Sci. 2009;15(2):11-6. Persian. 29. Sultana B, Anwar F, Przybylski R. Antioxidant potential of corncob extracts for stabilization of corn oil subjected to microwave heating. Food Chem. 2007;104(3):997-1005. doi: 10.1016/j.foodchem.2006.12.061. 30. Aridogan BC, Baydar H, Kaya S, Demirci M, Ozbasar D, Mumcu E. Antimicrobial activity and chemical composition of some essential oils. Arch Pharm Res. 2002;25(6):860-4. [PubMed: 12510839]. 31. Khanjari A, Rokni N, Soltani M, Rezazadeh SH, Radmehr B, Partovi R. [Effect of Zataria multiflora Boiss essential oil on log p% of Vibrio parahaemolyticus in BHI broth]. J Food Sci Tech. 2010;8(28):220-3. Persian. 32. Khaleghi A, Rezaei K, Kasaei MR, Khosravi-Darani K, Soleymani M. [Evaluation of antioxidant properties of Berberis crataegina extract on fat oxidation of beef sausages during refrigerated storage]. Iran J Nut Scie Food Tech. 2013;7(5):345-53. Persian. 33. Razavilar V, Abbasifar R, Radmehr B. [Effect of Zataria multiflora boiss essential oil, acetic acid, temperature and storage time on probable growth of Salmonella typhimurium in Brain heart infusion broth]. J Veteri Res. 2006;61(2):135-41. Persian. 34. Vuddhakul V, Bhoopong P, Hayeebilan F, Subhadhirasakul S. Inhibitory activity of Thai condiments on pandemic strain of Vibrio parahaemolyticus. Food Microbiol. 2007;24(4):413-8. doi: 10.1016/j.fm.2006.04.010. [PubMed: 17189767]. 35. Kirbağ S, Zengin F, Kursat M. Antimicrobial activities of extracts of some plants. Pak J Bot. 2009;41(4):2067-70. 36. Singh A, Jain D, Upadhyay MK, Khandelwal N, Verma HN. Green synthesis of silver nanoparticles using Argemone mexicana leaf extract and evaluation of their antimicrobial activities. Dig J Nanomater Bios. 2010;5(2):483-9.